This recipe is sponsored by Pacific Foods! I’m super excited to partner again with them this year to bring you delicious non-dairy recipes. Lemme introduce you to your new favorite pasta recipe. First, we roast cherry tomatoes until they are juicy and candy-like. Chickpeas are toasted with fennel, mustard seeds, red pepper flakes and just enough smoked paprika to make them taste a little like sausage. Then we toss the entire thing with Pacific Foods cashew plant-based beverage and penne pasta. It’s creamy, it’s spicy, it’s the perfect balance between rich/light and it’s incredibly delicious. I had to beg BL to stop taking bites of it before I finished photographing it. I use cashew cream a lot around here; it’s my secret weapon in making sauces thick and creamy, without cream. While I love the texture that cashew cream provides, it’s also a little indulgent. A quarter cup of cashews is roughly 160 calories, which can quickly add up when a recipe calls for 1 cup of pureed cashew cream. 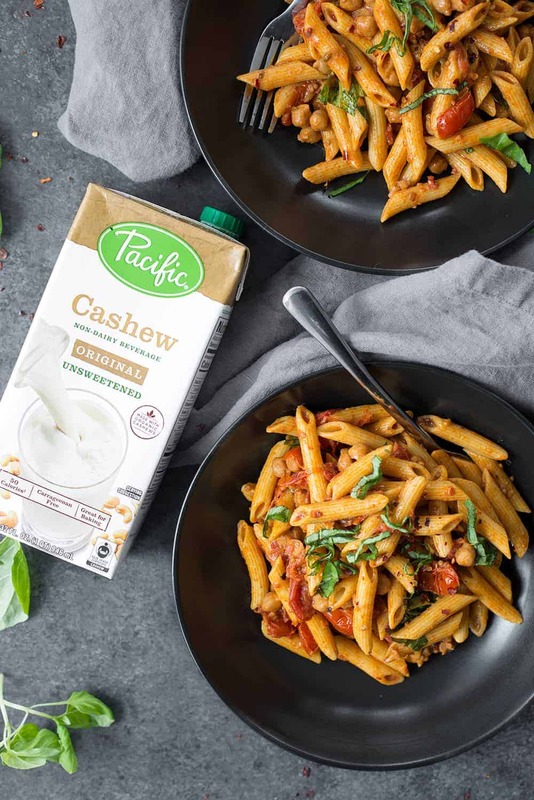 Therefore, when I saw that Pacific Foods launched a new cashew cream milk, I wondered if it would hold up the same way in my favorite creamy sauces. Spoiler alert, it does. And, if we are being honest, I might even like cashew milk more than cashew cream in this recipe. For one, there’s no prep involved. I don’t have to soak the cashews ahead of time and I don’t have to blend them. Major bonus points when I’m tired and don’t want to have to clean yet another appliance in the name of weeknight dinner. Sometimes cashew cream is too thick, too alfredo like. That can be a good thing when you want a heavy sauce, but not a good thing when you don’t. Using cashew milk instead still gives body, without weighing the entire thing down. Let’s talk about these chickpeas. 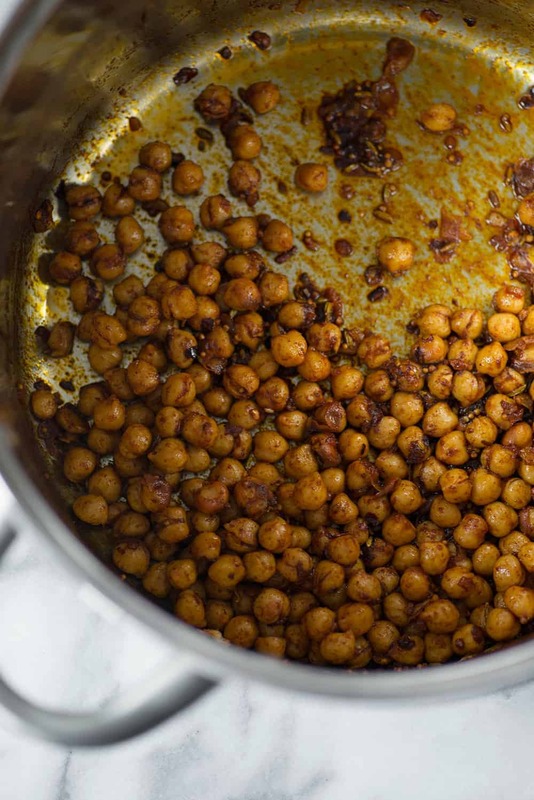 I got the idea for these spicy chickpeas after seeing them on Teigan’s Instagram. Wow, talk about flavor. They are spicy and meaty, thanks to the combination of both smoked paprika and fennel seeds. 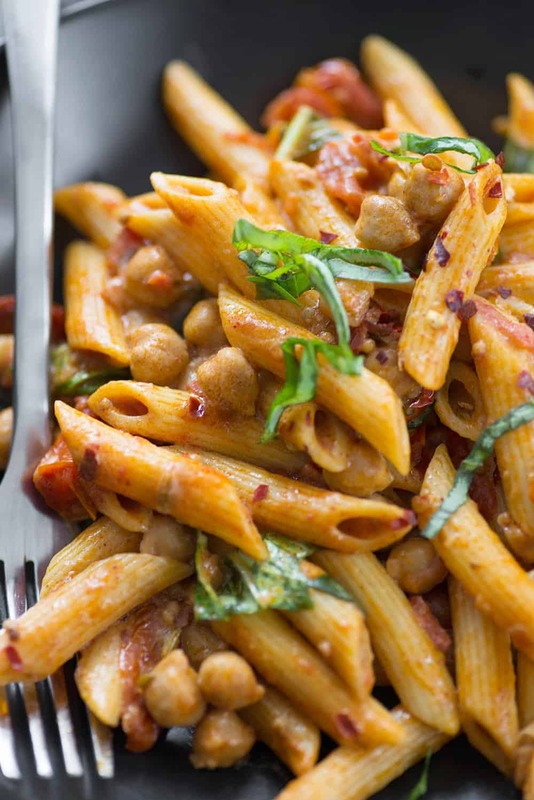 Tossed with chewy pasta, they provide a great texture contrast and a healthy dose of protein and fiber. Slow roasted cherry tomatoes are my way of eating tomatoes outside of the July and August months. It’s my answer to flavorless tomatoes that pop up every other time of year. Slow roasting them softness them, concentrates their flavor and brings the natural sugars to the surface. If you’ve ever wanted tomato candy, this recipe is for you. However, this technique might take this pasta out of the fast-weeknight dinner option. They don’t take a lot of prep, but they do take time. Therefore, I’ve got a few options for you. You can make the tomatoes ahead of time. This is probably a good idea anyways, as you’ll want to snack on half of them as they come out of the oven. You’ll also find that slow roasted tomatoes taste great with just about everything, so they won’t go to waste. If you are short on time, you can also pan roast the tomatoes until they burst. They won’t have the same texture, but it will work. I’ve done this many times and can attest that it’s the second best way to enjoy tomatoes when we aren’t in the dog days of summer. Once you have the tomatoes roasted and the chickpeas toasted, everything comes together really quickly. Add the tomatoes to the chickpea mixture along with the cashew milk. Then, add in pasta that’s slightly undercooked. I know I’ve talked about this technique several times before, as it’s my way of making perfect pasta. Cooking the pasta 1-2 minutes below the recommended cooking time allows you to finish cooking the pasta in the sauce. 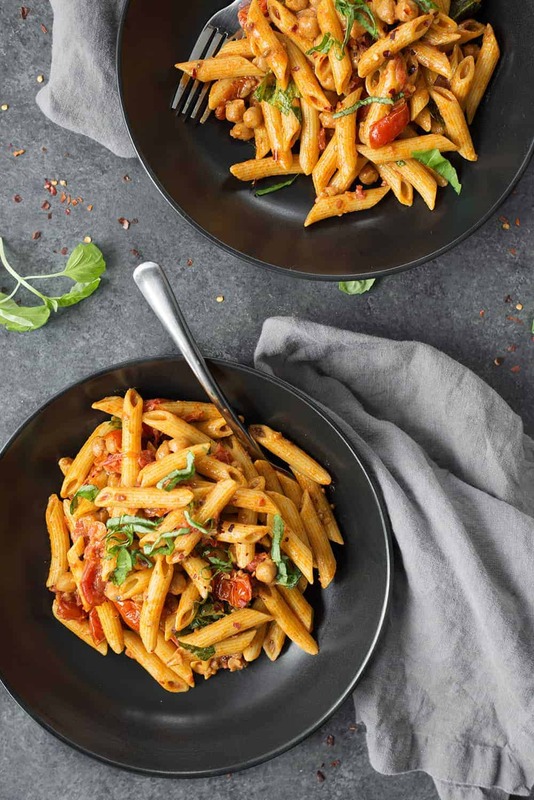 Not only does the pasta soak up the flavorful sauce as it finishes, it also soaks up the pasta cooking water which contain starches that help the sauce sling to the pasta. If silky pasta is your goal, try it this way. 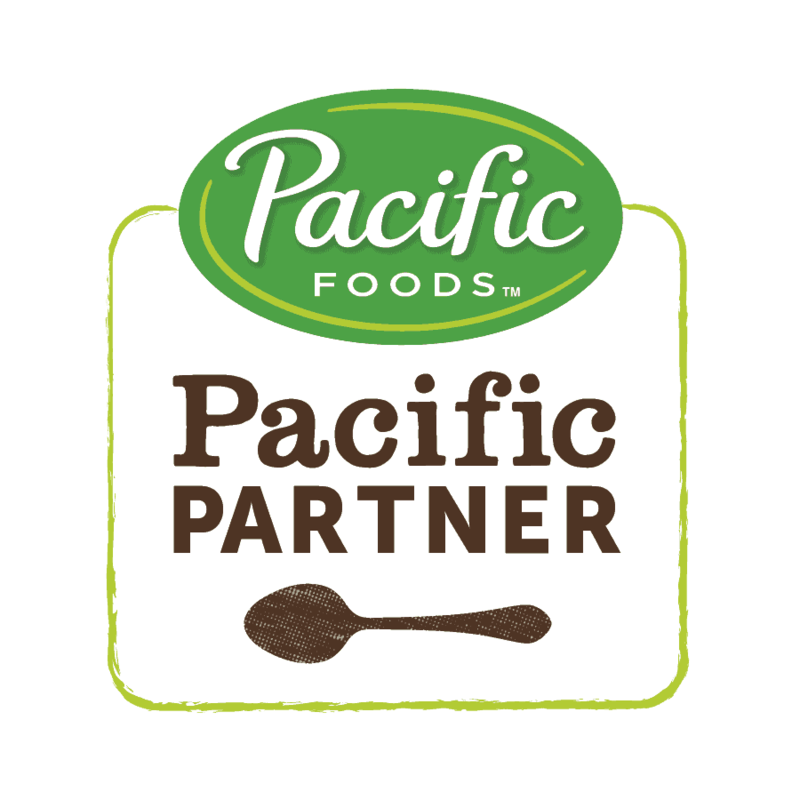 You can find Pacific Foods Cashew Milk at most well-stocked grocery stores, or you can buy it online. 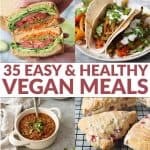 I’m excited to partner with them this year to bring you more non-dairy recipes. Let me know if there’s anything in particular you want to see! 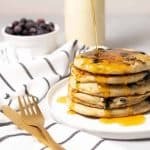 If you try these recipe, let me know! Leave a comment, rate it, and tag your Instagram photos with #delishknowledge . I absolutely love seeing your creations. Happy cooking! 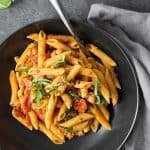 Spicy Tomato Penne Pasta! 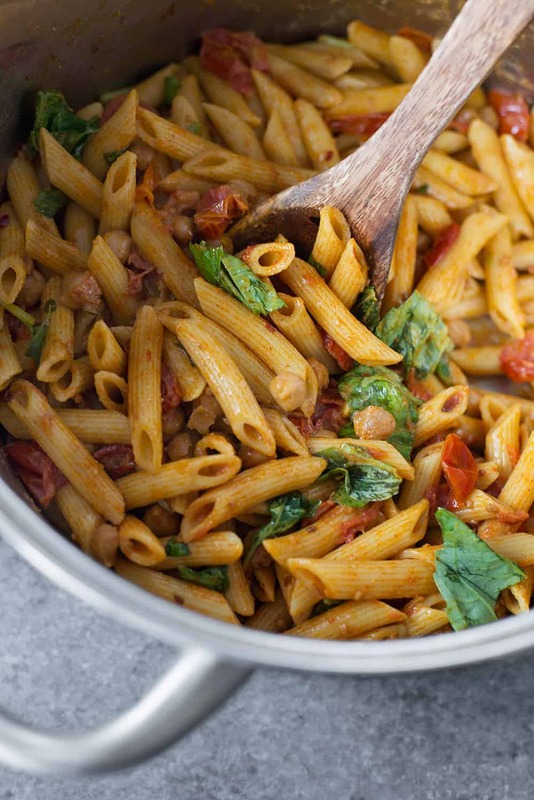 If you’re looking for a healthy, quick, vegan pasta recipe- this is it! Spicy chickpeas tossed with slow-roasted cherry tomatoes and a light cashew sauce. Light, healthy and delicious! Preheat the oven to 300 degrees F. Toss cherry tomatoes with 1 tablespoon olive oil, 1/4 teaspoon salt and pepper, then place in a single layer on a baking sheet and roast for 90 minutes, taking care not to brown. The tomatoes should be like a juicy sun-dried tomato, but not browned. You can do this ahead of time! Making the tomatoes like this tastes like candy, so I usually double the recipe for snacking on later. When the tomatoes are almost done, heat the remaining olive oil in a large stock pot over medium heat. Add the shallot and saute for 60-90 seconds until fragrant, then add the chickpeas and cook, stirring often, for 30 seconds until just crisped. Add the spices: paprika, pepper flakes, fennel seeds, mustard, garlic powder and remaining salt and pepper. Toss until beans are completely toasted and spices are fragrant, about 2 minutes. Stir often, taking care not to burn. At the same time, bring a large pot of salted water to a boil. Add the cherry tomatoes to the chickpea pot along with the cashew milk. Reduce heat to low and simmer while the pasta cooks. Add the pasta to the boiling water and cook for 1 minute until the recommended ‘al dente’ option on the package. Drain the pasta, reserving 1 cup of past water. 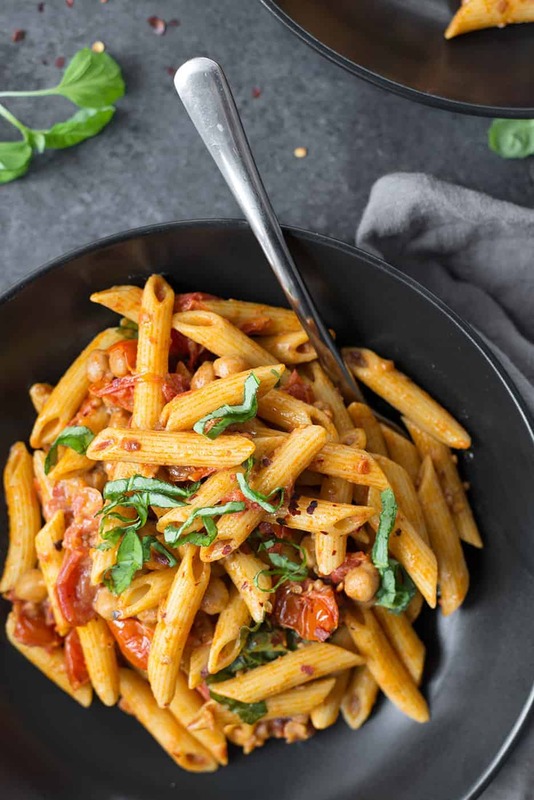 Add the just undercooked pasta to the cashew-tomato sauce and cook, stirring the entire time to finish cooking the pasta. Add pasta water, a tablespoon or two at a time, as needed to bring the sauce together. Season to taste with salt and pepper, as needed and add the torn basil leaves. Toss again and serve! This is my kind of pasta dish! Love slow roasting tomatoes during off-season months too!Love all the seasonings you added to this recipe too. That pasta looks SO good. I have not tried pasta sauces with a plant milk, but this looks worth trying. This sounds like such a great idea! Love cashew milk in my breakfast recipes. Me too! LOVE cashew milk, it’s so creamy!